Everybody likes to take a break once in a while, but too much of a good thing over the summer days can become hazardous to the functioning of the home. It has been shown in studies that children feel better and in more control of their selves when they have order and routine in their daily schedules. In our early years of adoption, it was imminent for our household to put in order a routine that our children could expect. Knowing what to expect and what is expected, along with consistency, provided security for our children that had so long been without any. And, although our situation might have been a more extreme case, every child functions better when they know what to expect and what is expected of them. Begin your routine with a flexible written schedule of how a typical day should go. Although your child may be able to sleep in more than during the school year, it is still advisable to get your child up at a decent morning hour to begin their day. It has also been proven that too much sleep can make one lethargic and less energetic to tackle their day. Getting an early start allows your child to exercise their brain when it most alert. Post the schedule wherever your child might benefit most from seeing it: the bathroom mirror, kitchen, memo boards, the fridge. On that routine list, include meals, personal hygiene, devotions, chores, quiet time, and activities. Some choose to put a wake up time, but then may be loose about other activities during the day. Pick a time that the family can be together at least once a day, whether it be a meal or activity. Remember to make breakfast a priority in your days, as kids function better when they are well nourished. Next Friday, I will expound on some ideas for healthy meals and snacks during the summer. Keeping blood sugars in check will definitely make a happier, more agreeable household. Also important, is to keep an updated calendar of the week's (or month's) events. Kids like to know when they are taking swimming lessons and how many weeks till camp. Allow each child to have their own events written in one color so they can clearly see what they have going on. Try not to overload your child's schedule with so many activities that they don't have any down time. Everyone needs down time. Without it, we all become cranky after a while. Schedule down time into your child's day as well. Mom needs a sanity break just as much as they need rest. This is a perfect time to allow them to go to their rooms and either do devotions or read a book. It might be a challenge to establish this at first, but it will become habit and you will be glad you did in the end. Use timers to teach youngsters to move along quickly, preparing them for when they may be in a school routine in the fall. This takes the pressure of starting it once there is also the pressure of getting to school on time. Use timers to also control screen time (TVs, video games, computer, etc.). Use timers to break up the monotony of chores and seat work, working in 10-15 minute intervals on any chore or project. Then take a few minutes to rest and relax or do another fun activity. Before you know it, the day is done and so is the work! I don't know about your house, but at my home getting the kids to do their chores is a struggle even when it is on our routine list each day. Years ago, I discovered a wonderful resource to help with this on flylady.net. In Flylady's plan, she uncovers a way to make chore time lots of fun. She sets up the children in "camps". They get to come up with their own names and their own cheers. They work together or compete for different "Olympic Games", such a "sock mopping" and "sock match up". Each chore is put in a fun, enjoyable game that makes chores hardly seem like chores at all. Join in on the fun and get a clean house in the end! By being a little creative (and a little routine), you will have a peaceful, happy house this summer. Another great article, Angie! Thanks for the resources and direction. 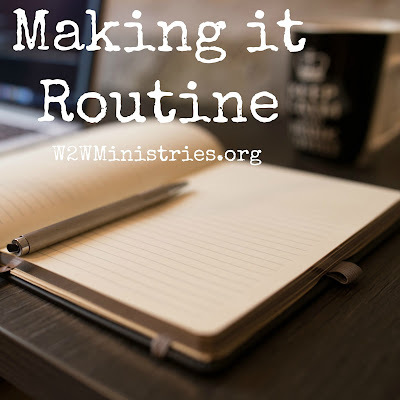 Routine is key for us for sure, even when we aim and miss on days, falling short of our plans we at least start out with a goal, and that makes for a more productive and lower anxiety day for all.